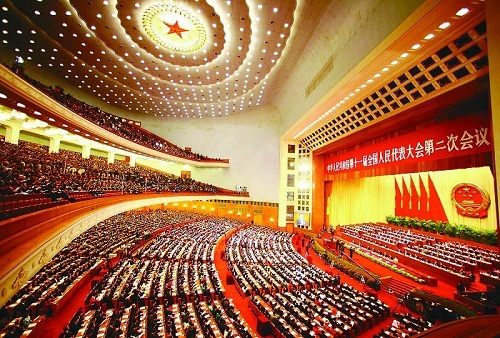 It is the first Parliament session being held by President Xi Jinping and Premier Li Keqiang after they took over in the leadership change in 2013. The session is composed of NPC deputies 人大代表 who are elected from 35 electoral units from the people’s congresses of provinces, autonomous regions and municipalities. Each congress is elected for a term of five years. A key signal of the Chinese leadership’s intentions will come in the announced growth target for 2014, to be released发布 on the first day. That’s when Premier Li Keqiang gives the gongzuo baogao, or “work report 工作报告,”China’s equivalent of the State of the Union, to the congress. This report usually includes the government’s expansion target for the year. China’s gross domestic product grew 7.7 percent in 2013, surpassing the official target of 7.5 percent but lower than the annual growth target of 8 percent between 2005 and 2011. The CPI inflation target and M2 growth target will likely be set at 3.5 percent and 13.0 percent, respectively, both the same as last year. The economists also expect the People’s Bank of China 中国人民银行 to maintain its neutral monetary policy stance as it reiterated its policy position in the fourth-quarter policy report. Planned fiscal deficit may be raised slightly to 1.35 trillion ($220 billion) in 2014 from 1.20 trillion in 2013, while the ratio of fiscal deficit to GDP could rise to 2.1 percent from 1.8 percent in 2013, according to the economists. Local Government Debt 地方政府债务 is top agenda during China’s National People’s Congress,China’s latest government debt audit showed that local government liability had swollen to around 17.9 trillion yuan at the end of June 2013, representing a nearly 70 percent increase from the 2010 tally of $10.7 trillion yuan. The latest figure is equivalent to a little more than 30 percent of GDP, compared to 25 percent of GDP three years ago. Environmental protection 环境保护 has been another key focus of the government.The Third Plenum pointed out the need to establish a fully-fledged system of rules of institutions to protect the environment. Less emphasis is put on GDP targets as an assessment for local government officials, while officials and local authorities will be held responsible directly for the pollution caused. In addition, issues related to pensions 养老金 could still be a hot topic given China’s aging population and mounting concerns over the current pension system.